Working with steel meant I was always modifying friend's, and my own bikes. 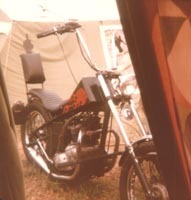 The first complete chopper I built used a Triumph 1979 T140V US spec Bonneville as the donor bike. I built the bike in 1980, the frame is of unknown origin bought from a breakers in Maryhill, Glasgow. The frame had been completely covered in catalloy with all the tubes molded into square section, when it was chipped off, it revealed holes burnt into the frame tubes by poor (read crap) arc welding - so beware of molding, it can hide a multitude of sins. The tank was also molded to the frame with a cutout for the speedo. The front end is standard bonnie, except for the 6 inch over fork tubes. The front mudguard is standard bonnie cut down into a Maltese cross shape (looked great but it didn't keep the spray off me when the roads were wet). The engine is basically standard with unfiltered and re-jetted carbs. 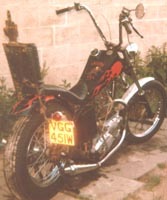 Chopper pot "silencers" were fitted to the standard header pipes. The seat is the infamous banana sore arse type. The back wheel is an early Triumph QD (Quickly Detachable) hub laced to a 16" rim. These hubs are an excellent idea i.e. you don't have to remove the chain, sprocket and brake to take the back wheel off. One small problem with them - they quickly overheat and fade (stop working) when giving it some wellie. It was a bit rough around the edges, but I have fond memories of this bike. The picture above is the Mark 1 version of the bike, the picture was taken in Govan Shipbuilders where I worked at the time. Same bike (above) with minor changes to the front mudguard and sissy bar. I also removed the side stand to improve ground clearance and fitted a vintage motorcycle's rear stand which mounts off the end of the hardtail and works like a centre stand. I kept the chopper like this for about 18 months and did a lot of miles on it, including a trip to the South of France where the picture below was taken. The only problems I had with this bike was a blown zener diode (this was cured by mounting it onto the engine, which is the biggest heat sink on the bike) and a back wheel bearing that collapsed while touring France, but that's another story.